Connection detailing depends on the forces and moments to be transferred, and on the chosen member sizes. However, some common detailing rules apply, which are discussed below, in order to gain an appreciation of the form of connections in regular frames. 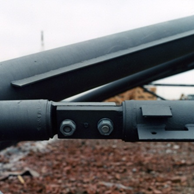 Flush end plate connections that are welded to the flanges and web of the beam are commonly used as nominally pinned connections, although they do possess some bending resistance. Normally the end plate is 10 mm to 12 mm thick for use with M 20 bolts. 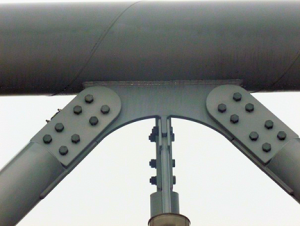 When used as moment connections, the end plate is thicker, typically 15 – 20 mm, and is extended above the top flange to allow for welding of the flange to the plate. 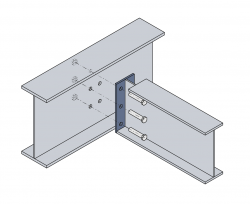 For connections to Square Hollow sections (SHS), a form of expansion bolt connection may be used that forms a connection by expanding into the space behind the face of the section. However, the diameter of the expansion part of the bolts is up to twice that of the bolt diameter and so the spacing between the bolt holes has to be increased compared to normal bolts. Alternatively, proprietary 'blind' fixings may be used. 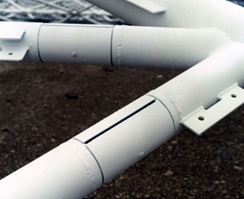 In-line connections that may be bolted or welded. In-line connections often occur in long members that require splicing for transportation. Inclined connections such as inclined bracing to horizontal chords. These are usually welded. 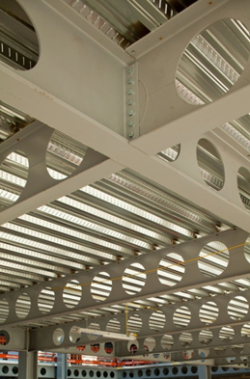 The chords and bracing in a truss or lattice girder are often welded. 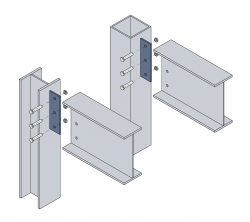 Where square hollow sections (SHS) are used then the ends of the SHS are cut to the required angle and fillet welded to the face of the SHS chords. Where circular hollow sections (CHS) are used then the ends of the incoming CHS inclined members have to be cut to form the precise shape around the chords. This is known as profiling which is a specialist process. 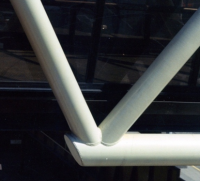 The figure shows the use of a shaped fin plate to provide more visual appeal to an otherwise simple connection between the top chord and bracing of a deep truss. For connections between circular hollow sections (CHS), the bracing members are profiled around the CHS chords, which is a specialist task. A good example in a long span roof truss is shown. 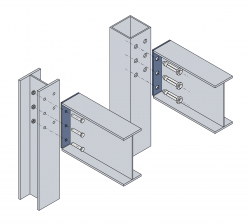 For connections between square hollow sections (SHS), the chord is continuous and the SHS brace is cut to the required angle so that it can be fillet welded to the SHS chord. 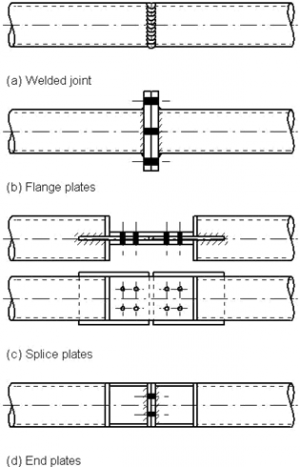 In-line connections are usually made by bolting, either by a flange plate with typically 4, 6 or 8 bolts (figure b), or a splice plate (figure c), or a half end plate (figure d), which can be concealed behind a cover plate. Various examples of these connections are shown below. 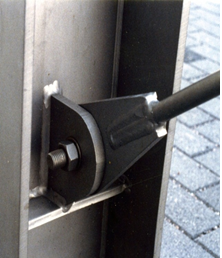 A circular cover plate may be held in place by long self-tapping screws so that the connection is not visible, as shown below. Couplers which require that the rods are threaded in opposite directions so that the coupler can be tightened. Pins which may be welded to the rods or provided with threads. The pin is normally connected to a fin plate that is welded to another member. 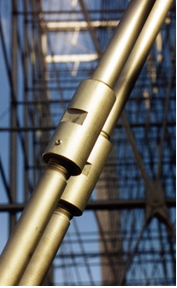 Rods and couplers are often stainless steel if exposed externally. 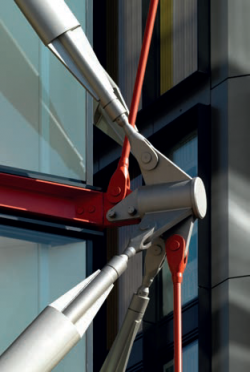 Good examples of stainless steel tie rods used in the external façade of the Helsinki Sanomat building are shown. 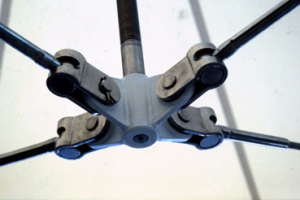 Where multiple connections between tie rods are required, special castings or fabricated nodes are necessary. Rods may be connected by various types of cast and formed nodes. The detail shown is supported from above by a threaded rod and the horizontal nodes allow for articulation in two directions.